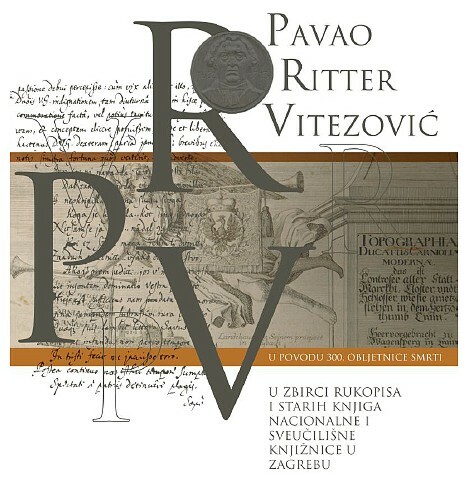 Pavao Ritter Vitezović was born in Senj on January 12, 1652 and died in Vienna on January 21, 1713. He attended elementary school in Senj and continued his education at a Jesuit high school in Zagreb, where his professor was Juraj Habdelić. After finishing the sixth grade in rhetoric, he quit school and went to Rome, where he met Johannes Lucius (Ivan Lučić). He was taught by cartographer Georg Matheus Vischer in Vienna. Vitezović spent the following two years in Bogenšperk (Wagensberg, Vagensperg), where Johann Weikhard Valvasor taught him surveying and copper-engraving. He prepared most templates for Croatian city views for Valvasor and engraved them in copper plates. He returned to Senj in 1679. As a city emissary, he travelled to the Viennese Parliament, where he advocated for Senj getting a royal charter and rights it had had for a long time. He participated in wars against Turks and became an officer for Nikola Erdödy. While he was staying as an emissary of Senj in Linz in 1684, he produced Odiljenje sigetsko and changed his German last name Ritter to Croatian Vitezović. He used to go outdoors and sketch cities and towers which he subsequently engraved in copper plates. This is how his copper-engravings were made which were incorporated in the album of Valvasor’s Topographia Ducatus Carnioliae modernae (Topography of Duchy of Carniola), as well as in Die Ehre des Herzogthums Crain (Glory of Duchy of Carniola) in 1689. He participated in wars for liberation of Lika and Krbava and became the vice-prefect of Lika in 1691. He took over the Land Printing Office (Zemaljska tiskara) at the session of the Croatian Parliament in Varaždin in 1694. Several important books, textbooks, calendars, prayer books and proclamations, and especially important, his historiographic work in Croatian Kronika aliti spomen vsega svijeta vikov from 1696 and a booklet in Latin titled Croatia rediviva regnante Leopoldo Magno Caesare (Croatia Revived under the Great Emperor Leopold’s Reign) from 1700. He was the director of the Land Printing Office from 1694 to 1709, while he signed as Paulo Ritter de Segna, nobili Croata (Pavao Ritter of Senj, Noble Croatian).